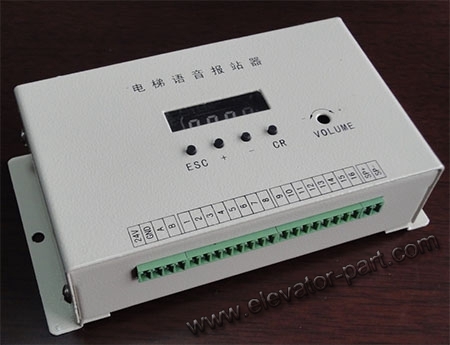 Elevator voice announcer is a dedicated, high-quality voice announcer, which uses a high-performance microcontroller and professional voice chip, supports MP3 file playback, which stored in FLASH or SD card (2G maximum). The user can change the voices played by a computer, to meet the different demand. It may apply for a maximum of 63 floors. It has a flexible interface, Including RS485 input, CAN input, leveling sensor input, BCD code, binary code, gray code and seven segment code input. It also has enhanced volume management capabilities in a specific period of time which automatically turn off the volume, to meet some special requirements of the individual user. It is under the control of a high-performance microcontroller, achieves signal detection, signal processing, voice announcer and volume management functions. The following figure is a schematic diagram of its implementation. AN1 (ESC): Back button. When in the menu state, click on this button to return to the previous menu. AN2 (+): Plus button. When in the normal state, press this button to switch the display content in the following order: ①port monitoring; ②time (24 hours); ③ Month Day; ④years; ⑤floor display, and hold this button to increase the voice playback volume. When in function setting mode, press this button to select the menu and to increase the set value. AN3 (-): Minus button. When in the normal state, press this button to switch the display in the following order status: ①floor display; ②years; ③ Month Day; ④time (24 hours); ⑤port monitoring, and hold this button to reduce the voice playback volume. When in the function setting mode, press this button to select the menu and reduce the set value.